The eighth Hornet (CV-12) was launched 30 August 1943 by the Newport News Shipbuilding & Dry Dock Co., Newport News, Va.; sponsored by Mrs.Frank M. Knox, wife of the Secretary of the Navy, and commissioned 29 November1943, Captain Miles M. Browning in command. 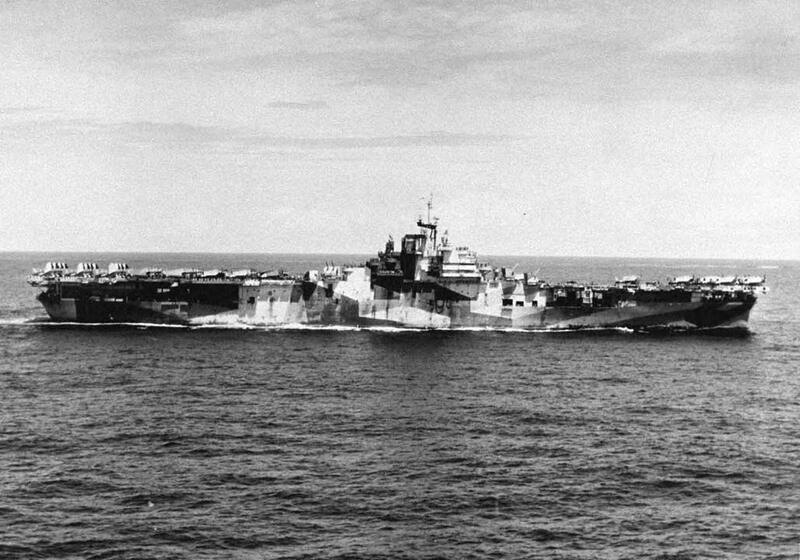 Hornet conducted shakedown training off Bermuda before departing Norfolk14 February 1944 to join the Fast Carrier Task Force 20 March at Majuro Atoll in the Marshalls. After lending air support to protect the invasion beaches in New Guinea, she conducted massive aerial raids against Japanese bases in the Caroline Islands and prepared to support the amphibious assault for the occupation of the Marianas Islands. On 11 June 1944 Hornet launched raids on Tinian and Saipan. The following day she conducted heavy bombing attacks on Guam and Rota. During 15 to 16 June, she blasted enemy airflelds at Iwo and Chichi Jima to prevent air attacks on troops invading Saipan in the Marianas. The afternoon of 18 June1944 Hornet formed with the Fast Carrier Task Force to intercept the Japanese First Mobile Fleet, headed through the Philippine Sea for Saipan. The Battle of the Philippine Sea opened 19 June 1944 when Hornet launched strikes to destroy as many land based Japanese planes as possible before the carrier-based Japanese aircraft came in. The enemy approached the American carriers in four massive waves. But flightier aircraft from Hornet and other carriers did a magnificent job and broke up all the anttacks before the Japanese aerial raiders reached the task force. Nearly every Japanese aircraft was shot down in the great air battles of 19 June 1944 that became commonly known as "The Marianas Turkey Shoot." As the Japanese Mobile Fleet fled in defeat on 20 June,the carriers launched long-range air strikes that sank Japanese carrier Hiji and so damaged two tankers that they were abandoned and scuttled. Admiral Ozawa's own flag log for 20 June 1944 showed his surviving carrier air power as only 35 operational aircraft out of the 430 planes with which he had commenced the Battle of the Philippine Sea. Hornet, basing from Eniwetok in the Marshalls, raided enemy installations ranging from Guam to the Bonins, then turned her attention to the Palaus,throughout the Philippine Sea, and to enemy bases on Okinawa and Formosa.Her aircraft gave direct support to the troops invading Leyte 20 October1944. During the Battle for Leyte Gulf she launched raids for damaging hits to the Japanese center force in the Battle off Samar, and hastened the retreat of the enemy fleet through the Sibuyan Sea towards Borneo. In the following months Hornet attacked enemy shipping and airfields throughout the Philippines. This included participation in a raid that destroyed an entire Japanese convoy in Ormac Bay. On 30 December 1944 she departed Ulithi in the Carolines for raids against Formosa, Indo~China and the Pescadores Islands. En route back to Ulithi Hornet planes made photo reconnaissance of Okinawa 22 January 1945 to aid the planned invasion of that "last stepping-stone to Japan." Hornet again departed Ulithi 10 February for full scale aerial assaults on Tokyo, then supported the amphibious landing assault on Iwo Jima 19-20February 1945. Repeated raids were made against the Tokyo plains industrial complex,and Okinawa was hard hit. On 1 April 1946 Hornet planes gave dimt support to the amphibious assault landings on Okinawa. On 6 April her aircraft joined in attacks which sank the mighty Japanese battleship Yamato and her entire task force as it closed Okinawa. The following 2 months found Hornet alternating between close support to ground troops on Okinawa and hard-hitting raids to destroy the industrial capacity of Japan. She was caught in a howlingtyphoon 4 to 5 June 1945 which collapsed some 25 feet of her forward flight deck. Hornet was routed back to the Philippines and from there to San Francisco,arriving 7 July 1945. Her overhaul was complete by 13 September 1945 when she departed as a part of the "Magic Carpet" operation that saw her return home troops from the Marianas and Hawaiian Islands. She returned to San Francisco 9 February 1946. She decommissioned there 15 January 1947,and joined the Pacific Reserve Fleet. Hornet recommissioned 20 March 1951, then sailed from San Francisco for the New York Naval Shipyard where she decommissioned 12 May 1951 for conversion to an attack aircraft carrier ( CVA-12) . She recommissioned 11 September 1953 and trained in the Caribbean Sea before departure from Norfolk 11 May1954 on a month global cruise. After operations in the Mediterranean Sea and the Indian Ocean, Hornet joined the mobile 7th fleet in the South China Sea where 25 July, searchplanes from her task group shot down two attacking Chinese Communist fighter planes. She returned to San Francisco 12 March 1954, trained out of SanDiego, then sailed 4 May 1955 to join the 7th fleet in the Far East. Hornet helped cover the evacuation of Vietnamese from the Communist controlled north to freedom in South Vietnam, then ranged from Japan to Formosa, Okinawa,and the Philippines in readiness training with the 7th fleet. She returned to San Diego 10 March 1955 and entered the Puget Sound Naval Shipyard the following month for conversion that included a hurricane bow and the installation of an angled flight deck which permits the simultaneous launching and recovery of aircraft. Following her modernization overhaul, Hornet operated along the California Coast. She departed San Diego 21 January 1957 to bolster the strength of the 7th fleet until her return from the troubled Far East 25 July. Following a similar cruise, 6 January-2 July 1958, she was converted to an Antisubmafine Warfare Support Carrier (CVS-12) in the Puget Sound Naval Shipyard. On 3April 1959 she sailed from Long Beach to join the 7th fleet in antisubmarine warfare tactics ranging from Japan to Okinawa and the Philippines. She returned home in October, for training along the western seaboard. In the following years, Hornet was regularly deployed to the 7th fleet for operations ranging from the coast of South Vietnam, to the shores ofJapan, the Philippines and Okinawa. On 25 August 1966 she was on recovery station for the unmanned Apollo moonship that rocketed three-quarters of the way around the globe in 93 minutes before splashdown near Wake Island.Scorched from the heat of its re-entry into the Earth's atmosphere, the Apollo space capsule, designed to carry American astronauts to the moon,was brought aboard Hornet after its test. Hornet was the recovery carrier for the Apollo 11 moon mission during which astronauts Neil Armstrong, and Edwin Aldrin Jr., landed on and walked on the moon in July 1969. Fellow astronaut Michael Collins remained in orbit around the moon. On 24 November, the Apollo 12 astronauts ó all Naval Aviators ó Richard F. Gordon, Charles Conrad Jr., and Alan L. Bean were recovered by Helicopter Antisubmarine Squadron Four (HS 4) and returned to Hornet.